The deadline for submitting a Hall of Fame ballot was midnight New Year's Eve. I was still pondering my vote around the time most people were putting lampshades on their heads. The player causing my angst was Bernie Williams. My initial instinct was not to vote for him. I considered him a very good player but just a notch below Cooperstown. And everyone I asked agreed. People I didn't ask also agreed, including a writer who covered Bernie's entire career. All that was against him. Plus, he was a Yankee. The more I looked at the numbers, though, the better Bernie's case seemed. He was a batting champion who hit .300 eight times and finished with nearly as high an on-base percentage (.381) as Tony Gwynn (.388) and a higher OPS than Gwynn (.858 to .847) with more home runs and RBIs and nearly as many runs. Now, you can gerrymander stats to make a Hall of Fame case for anyone (well, maybe not Milton Bradley) but those are important stats that compare very favorably to a no-doubt-about-it first ballot Hall of Famer. In the end, I voted for Bernie. If you think doing so lowered the Hall of Fame's lofty standards and besmirched past inductees Bruce Sutter, Bowie Kuhn, Effa Manley and Whitey Herzog, don't worry. I won't vote for Bernie next year. Or the year after. Or the year after that. Because unless the voting rules change, I won't be able to vote for him. Why? Because the rules state we can vote for a maximum of only 10 players, and with the candidates coming up, Bernie won't crack my top 10 again. This limit has been the rule since the first year of Hall of Fame voting in 1936, when members of the Baseball Writers Association of America were instructed to vote for 10 players from any combination of positions, with 75 percent of the vote required for election. As Hall of Fame researcher Bill Francis relates, the writers were expected to elect 10 players from a list of 51. That was optimistic. You can't get 75 percent of baseball writers to agree on whether we would like free ice cream in addition to free hot dogs in every press box. I don't know. It might damage our credibility and objectivity. Plus, would it come with a receipt for our expense reports? This helps explain why 28 writers didn't vote for Rickey Henderson three years ago. Anyway, the 10-player maximum remains in effect 76 years later. And that's a problem with the steroid-associated players hitting the ballot. Some writers hold steroid suspicions against a player. Some don't. The bottom line is, steroid accusations are going to keep otherwise certain Hall of Famers from reaching the 75 percent vote needed for election, thereby creating a huge and unwelcome logjam on the ballot. Due to the steroid issue and a general lack of consensus, the following players will probably be on the ballot in three years: Barry Bonds, Roger Clemens, Pedro Martinez, Randy Johnson, Sammy Sosa, Jeff Bagwell, John Smoltz, Edgar Martinez, Mark McGwire, Mike Mussina, Jeff Kent, Larry Walker, Alan Trammell, Fred McGriff, Rafael Palmeiro, Lee Smith, Tim Raines, Gary Sheffield, Mike Piazza, Curt Schilling and, of course, Bernie. That's 21 players who warrant serious consideration. And that's not counting Barry Larkin, who might be elected this year, and also assuming Greg Maddux, Tom Glavine, Craig Biggio and Frank Thomas make it their first years on the ballot. Finding room for Bonds, Clemens, Pedro, Johnson and others means I'll have to dump more good players from my ballot than the Marlins dumped after winning the 1997 World Series. As Joe Posnanski writes, this won't be the first backlog of deserving players on the ballot. But that doesn't make it any more appealing than saying this Christmas wasn't the first time there was a glut of movie screens showing an Alvin and the Chipmunks movie. Here's the problem: Due to the steroid era, maintaining the 10-man limit will have a negative effect on the Hall of Fame because it will prevent deserving players from receiving votes they otherwise would get because there simply isn't enough room on the ballot. That isn't fair and it skews the voting process. Lifting the maximum, meanwhile would have no negative effect. Who cares if I vote for 12 or 15 or 25 players? If the players don't "deserve'' election, they won't get the 75 percent. But why should we be prevented from voting for as many players as we think are deserving? The limit needs to be eliminated, though I haven't been able to get an entirely clear answer on whether that would be up to the writers, the Hall or both. Just getting the writers to do so would take years. We are a very stubborn, stodgy organization. It was only a couple of years ago that we voted to include Internet writers, and even then, we attached enough strings that if you tied them end-to-end, they just might circle our combined waistlines. Look, we all differ on our standards for the Hall of Fame. That's why players need 75 percent of the vote, to assure consensus among even baseball writers. But we should at least all agree that a player should receive a vote based on his career, not on a completely arbitrary and unnecessary ballot limit. As BBWAA secretary Henry Edwards said back in 1936 after the uproar over the first Hall of Fame vote: "The ballot did not say the voter had to vote for the players I listed. I simply set down a bunch of the best names without any intention to lock out anybody. I am led to suspect that some of the electorate is very dumb." You know the drill. Each week I give you a fragment from an old box score and challenge you to determine what game it is from and why it's significant. I give this one a difficulty rating of 5 (scale of 10). Answer below. Upper Deck Tape this above your treadmill. 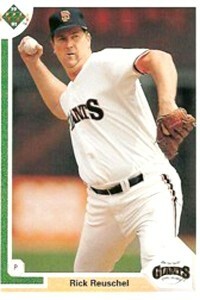 This card of Rick "Big Daddy" Reuschel (1991 Upper Deck No. 249) is a good reminder to keep to your "lose 15 pounds'' New Year's resolution. The only clue required was the name Murakami. This box score is from the Sept. 1, 1964 game between the Giants and the Mets when Masanori Murakami became the first Japanese pitcher in major league history. Pitching here under an agreement between the Giants and the Nankai Hawks, Murakami went 5-1 with a 3.43 ERA in two seasons before returning to Japan in a dispute over who owned his contract. Nearly three decades would pass before another Japanese player (Hideo Nomo) came to the majors. This coming season, Yu Darvish will be at least the 36th Japanese pitcher to play in the majors. Jim Caple is a senior writer for ESPN.com. You can follow him on Twitter at jimcaple. Caple: Are St. Louis fans the best?